PATRON SAINT OF: Not a patron saint. GUIDANCE: Born an impoverished free man in a strongly class-conscious society. Farm worker, field labourer, and mat maker. Married layman with no children. A mystical and religious man even as a pagan, he became an adult convert to Christianity around age 50, taking the name Juan Diego. Widower in 1529. 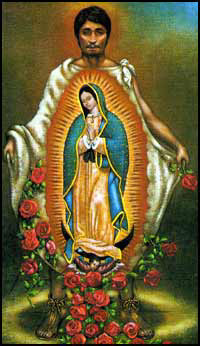 Visionary to whom the Virgin Mary appeared at Guadalupe on 9 December 1531, leaving him the image known as Our Lady of Guadalupe. On 20 December 2001 a second miracle attributed to Juan Diego's intervention was decreed by the Congregation and approved by Pope John Paul II.